Are you adequately compensating your accounting and finance professionals? We know that one of the hardest parts of hiring is determining the market value of a potential employee. Navigating this challenge requires good, accurate information. 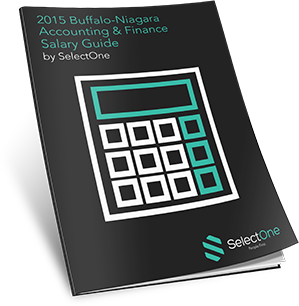 SelectOne's 2015 Buffalo-Niagara Accounting & Finance Salary Guide was created with one goal in mind: to help our clients and candidates make knowledgeable decisions by compiling comprehensive salary information for the financial services industry. DOWNLOAD THE EBOOK TODAY TO GET ALL OF THE INFORMATION YOU NEED.